It’s now a week later than I promised, but the next part of the Shadow of Time story is finally here! Read it right here! “Finally…justice is served,” the ex-resident of the ARK shouted. Nothing but destruction and scorn awaits Shadow aboard the Space Colony ARK, the space gadget that was once his own home. A cosmic fall is imminent. And then the Black Arms can finally rule. I figured, “Eh, why not?” So here’s a little preview of what I’m posting next week. Doom’s Eye approaches from behind. “Well done, Shadow. Meet me in the cannon’s control room.” It flies off just as quickly as it arrived. With no ammo remaining, Shadow discards the weapon, as heavy footsteps across the glass floor can be heard from behind him. “It’s been a long time…Shadow.” Shadow turns to look into the achromatic eyes of the GUN Commander, who points his pistol directly at Shadow’s head. Shadow has to take a step back as he clutches at his head. “That explains…why…” His eyes dart back and forth as he starts to connect everything, the promises, the demands, the memories, the alien soldiers. The Commander snaps him out of it with a loud shout. “You don’t fool me! It’s not just about Maria! Thanks to you, everyone I knew and loved was killed aboard the ARK. Finally…justice is served!” He suddenly pulls the trigger, and the gunshot sounds violently through the otherwise silent space. But no one is standing in front him. He only has a moment to realize that he missed before he is struck in the back of the head by Shadow’s kick. He collapses onto the floor as his dropped weapon slides a fair distance away. The Commander tries to contain his rage by pressing his fingers into the solid glass floor. He mutters quietly, “I’ve waited too long to let you get away that easily.” Too far from his gun, he draws a knife that he had concealed. “You’ll regret turning your back on me!” He quickly stands and charges at his foe with the sharp weapon. Since part one was done last week, we’re now on to part 2, or at least, the transition between the two. As I mentioned that I didn’t plan on splitting these episodes, I had no obvious split point in mind. It needed to be a place roughly in the middle which still left both parts with an appropriate amount of action. Usually, that would mean putting the faux final battle in the first part, and the Super (Hyper in this case) final battle in the second. But this time, I was subverting the whole faux final battle thing to begin with. Sonic jumped straight into his Super fight against Lumis, but the true final battle turned out to be without the Emeralds, against Chaos. Even if splitting those two apart had worked out in terms of even word count, it would’ve shamefully ruined my subversion of the formula to mark an entire Super fight as “part 1”, since it would’ve been so obvious to predict there would be more. Luckily, I suppose, the need to have Tails, Knuckles, and Amy play a role by fending off Eggman and the Lumis clones took up quite a few more words than I expected, making for plenty of part 1 action. The specific cutoff point, with Amy dangling over the magma, was not intended to be a cliffhanger, just another dramatic part of the episode. So the first thing to come up in this second part was the chant of the Master Emerald, otherwise known as Tikal’s Prayer. The decision to make an extended version…came fairly recently. It isn’t so much that I wanted a bond between Chaos and Knuckles, as that it was lingering in the back of my mind that they grated on each other a bit in an earlier episode, in a way that didn’t seem resolved. On top of that, I did actively want some more resolution to the themes of the first episode of this arc, in regards to the comparisons of Knuckles as Guardian to Sonic as Controller, and of course, the original reference to S3&K and the Super Emeralds. Of course, the stealing and recovery of the Master Emerald was supposed to be enough to make Knuckles seem important after his introduction, but I quickly realized that that alone would fall completely flat. So, I needed to make Knuckles integral to victory in the final battle, I needed to make my S3&K reference more important, and I needed some way to form a bond between Knuckles and Chaos. And the one thing that ties all of those things together is the Master Emerald, which really needed a better reason to be there anyways. It took some thinking, but I decided on Tikal’s Prayer as a good thing to link it together. Part of that thought process involved something that’s been nagging at me ever since Speed of Time. Ever since Cast by the Light, really, though I didn’t quite think about it at that time. The prayer on its own is so…empty. My vague-ish memories of Sonic X at that time made think of the prayer as a longer, more drawn out speech that could be repeated once or twice if necessary. But copying it down for Silver’s scene in Speed of Time, I realized it was way shorter and less dramatic than I was expecting. Then, analyzing the exact phrasing more closely, I realized that there was a bit of a hole in it. It’s almost kind of song-y in the way it’s presented, the servers are the Chaos, the Chaos is the power, the power relates to the heart…and then all of a sudden, the Controller links back to the Chaos. The structure gives the sense of a circle, but that circle is broken in the middle. Of course, Sonic X actually did something that I didn’t realize until I started researching, by adding the line “The heart is the controller,” thus making a complete circle. But that line…doesn’t make a lot of sense to me, especially seeing as Tikal seemed to imply that the Master Emerald is this unspecial non-capitalized “controller.” And since Sonic X isn’t exactly canon, I decided to ignore its suggestion in this instance, and go for something a little more helpful for my circumstances. I pose in this episode that this missing link between the heart and the Controller is, in fact, an entire missing half of the prayer that has been lost to time. But Chaos, who was there ten thousands years ago when the prayer was written (maybe he even wrote it himself, who knows? ), knows this missing half, and was able to teach it to Knuckles. Conveniently for me, this half just so happens to encompass the underlying themes of Chaos and Balance that this series revolves around. Now, the prayer is far more dramatic and climactic, specifically built to be able to repeat itself if necessary. Also of note for this recomposition is the fact that in the past, Tikal used the phrase “The seven Chaos Emeralds are the servers,” where Knuckles says “The servers are the seven Chaos.” I pose that this is because Tikal picked up from the loop instead of the very beginning of the full prayer, and just so happened to leave out the important parts, being rushed for time. Alright, sorry that topic was so long. On to the next. I already touched on it, but the Super Emeralds definitely deserve their own discussion. Now, I know that this is probably the second most fanfiction-y thing I’ve ever done (I don’t like to talk about the first), but I came to this decision after a lot of hard thinking. Sonic 3 & Knuckles, as a cohesive unit with Super Emeralds, is non-canon, and I hope I’ve made that much clear. Sonic Team themselves have taken a similar stance. But Sonic 3, and Sonic & Knuckles, are each individually canon. Which means that, hypothetically, the Super Emeralds could have happened, but the circumstances required simply didn’t occur in the canon timeline. And if it could have happened then, why not now? Of course, even then I couldn’t quite bring myself to do it all the way. The Super Emeralds technically did not appear in this episode, merely a representation of them. It was Chaos and the power of the Moonstone that induced the proper Hyper Transformation. And that brings me to another topic. 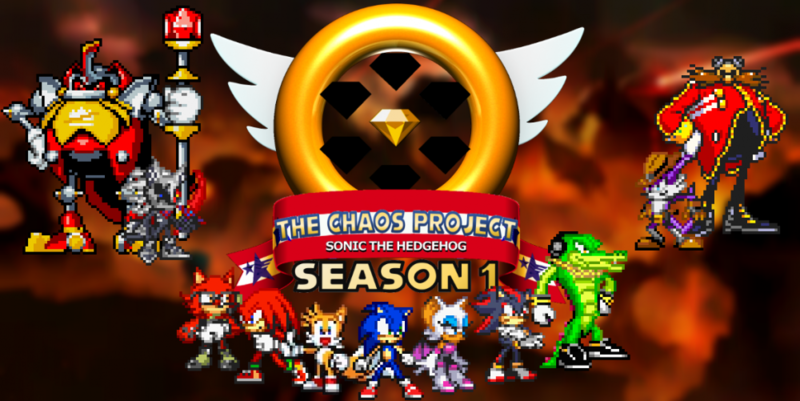 This is something that’s been a long time coming, something that I intended to do for the first episode of this arc, but ended up pushing back because Chaos didn’t really appear in that episode. That would be his conceptual origins. Much like Blacklight, Chaos is a reimagination of an old concept from the days when my brother and I were children, dreaming up concepts for Sonic game ideas. This idea, in particular, was more my brother’s idea than my own. This idea was for Hyper the Hedgehog. Hyper, an orange hedgehog with a “Hyper Emerald” embedded in his chest, and covered in grey circuit board-like lines that would become injected with color when he holds a Chaos Emerald, was created when Sonic touched the Hyper Emerald after it fell from the sky. The point of Hyper was to reintroduce Hyper Sonic to the modern canon, without the inclusion of Super Emeralds, as he could fuse with Sonic to induce that transformation. But that would be where the similarities to Chaos end. The Hyper Emerald, rather than coming from any kind of Realm of Chaos like the Moonstone, was instead one of many fragments of leftover material from the creation of the universe (a concept that may sound familiar to readers of Yuni Oha’s “Pokémon Cosmic Quest“). Hyper as a character was built to refill the anti-hero role that Shadow was slowly leaving in favor of a more heroic one, very different from the role of Chaos. I suppose there is also a similarity in that the final battle of Hyper’s introductory game idea took place in a volcano. Anyways, pictured below is a drawing I once made of Hyper in his first moments of life, which hangs on my wall just like the picture of Blacklight I showed off. “Who am I?” was his first words. This was quite a few years after that other picture, so I’m not nearly as embarrassed about it. In fact, I’m even a little proud, considering my poor art skills in general, especially at that time (although, the scanner I used didn’t do much justice to the already poorly used colored pencils). Anyways, if you look closely around the head, you may notice a lot of erasure marks. There was a lot of trial and error with those spikes. And one among many of those trials was a spike design which now exists in the form of Chaos (personally, I liked that design for Hyper, but Yuni insisted that I change it to what you see in the final product). Also of note is the little colorless robot by his foot. That’s Servo, who, in the scene depicted, was commanded to pick up the Hyper Emerald just before it transformed. Before Orbot and Cubot ever existed (well, Cubot anyways), Yuni invented Servo as a snarky servant robot who exists mostly as someone for Eggman to talk to. I considered using Servo for this series, but it would have been silly to replace Orbot and Cubot with a practically identical concept. The reason he’s colorless in the picture is because I never bothered finishing him. He’s actually supposed to have a body, not just wheels and a head, but I forgot about that when I first drew it, and again, never bothered fixing it. So, back on the topic of the episode itself, I guess. I’ll skip along to things I was contemplating, but ultimately decided against, including a scene depicting Knuckles, Tails, and Amy making their way through a cave before making it to the volcano’s interior, and, more noticeably, a scene depicting Chaos being freed from Eggman’s control. I’m sure it probably ended up being a little awkward skipping straight from climax to epilogue without a clear resolution, but honestly, I had no idea how to really write this cancelled scene without just wasting time. I suppose it could have helped if I moved a little bit of the awkward dialogue with Chaos and the rest of the characters to this cancelled scene, but having everyone just standing around and talking on an empty battlefield would have felt even weirder. But it’s okay if it’s at a Birthday party. Speaking of the Birthday party, it’s a little sad that it’s a day late in universe, but five months late out here. Unfortunately, I simply couldn’t write any faster. Tails’ mention of the beach day he and Sonic had planned was a reference to the epilogue of Speed of Time. I planned on having that mentioned in part 1 of this arc, but it didn’t come up, and I forgot to add it back in before I published it. And even though there are other things to say, I’ll have to cut things off here, or risk talking for days to come. These two reviews have already taken me three full days of writing time to make. But…I suppose this makes the last planned publishing…indefinitely. Allow me to remedy that. Nothing’s changed for The Chaos Project, but I think I can promise another part of Shadow of Time in…two weeks. That would be December 16th. So…I guess I’ll see you then.